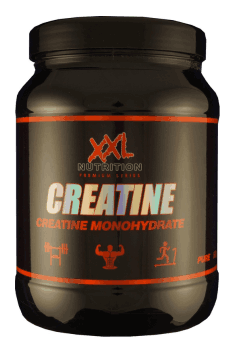 XXL NUTRITION Creatine is a high quality supplement containing creatine in the best absorbable form of monohydrate. The preparation boosts the energy production in the body, promotes muscle anabolism and increases the volume of muscle tissue. The packaging contains 500g of a convenient to use powder with a neutral taste. Creatine - is a chemical compound naturally found in the body, made of three amino acids: glycine, arginine and methionine. In the liver, pancreas and kidneys, creatine is converted to phosphocreatine (PCr), even 95% of the PCr present in the body is found in skeletal muscle. Phosphocreatine gives its phosphate group to adenosine-5'-diphosphate (ADP) to produce adenosine-5'-triphosphate (ATP) in the oxidative phosphorylation process. ATP is the energy carrier in the body that gives its energy in many biochemical processes, which leads to the formation of ADP. Thus, creatine helps to improve the process of re-synthesis of ATP from ADP, thus increasing the level of energy at the cellular level. The form of creatine monohydrate used in the preparation is a combination of creatine and water molecules. Creatine monohydrate increases the water content in cells and the muscle volume, it also helps to transport with water other nutrients, such as amino acids or sugars that promote regeneration and building muscle mass. Creatine, contributing to faster reproduction of the high energy substance- ATP, helps to increase strength and muscular endurance. It is worth noting that ATP participates, among other things, in muscle contractility. Research confirms that the use of creatine contributes to the increase in the level of oxygen (VO2 max), which is an extremely important parameter that shows the body's ability to use the oxygen. Creatine also helps to increase the resynthesis of muscle glycogen, which may be beneficial for people performing two training units a day. Increased levels of muscle glycogen enhance the intensity and duration of exercise. In addition, creatine by improving the production of energy in the body may delay the appearance of tiredness during training and increase the body's tolerance to its perception. Creatine monohydrate has strong anabolic properties. As mentioned, along with water can provide the nutrients necessary for the regeneration of muscle tissue. However, more important factor from the point of view of hypertrophy is increasing the level of the strongly anabolic level of insulin-like growth factor-1 (IGF-1), which intensifies the synthesis of muscle proteins. In addition, it has been proven that creatine supplementation reduces damage to muscle fibers induced by strength training, which positively affects the process of increasing muscle mass. Creatine also reduces the concentration of myostatin - a hormone that inhibits muscle growth, it is an IGF-1 antagonist. Too high level of myostatin may lead to the loss of muscle tissue called sarcopenia. Creatine therefore also acts as a strong anti-catabolic. Creatine can be an effective supplement for people suffering from chronic fatigue syndrome. It is often associated with mitochondrial dysfunction and insufficient energy production. Creatine occurs naturally only in meat, especially red meat and fish, so people on vegan diets may suffer from its deficiency. ATP also supplies energy to brain cells. The weight of the brain usually does not exceed 2% of body weight, while the energy request of this organ is around 20% of the daily energy requirement. Improved ATP resynthesis is associated with an increase in cognitive functions, allowing for faster acquiring new knowledge and better recalling memories. In summary, XXL NUTRITION Creatine is a supplement containing the most-used and the most effective substance, which increases the body's capacity- the creatine. It contributes to the improvement of energy processes and, as a result, increased production of power and strength in training. Creatine also supports the building of muscle mass and protects muscles against catabolism. A convenient powdered form with a neutral taste can be added to other liquid forms of supplements used around the training time without affecting the taste. One portion (5g) in the morning on an empty stomach and one portion (5g) immediately after training, preferably with a carbohydrate supplement, such as carbo. For maximum effects it should be used every day. The above mentioned dosing scheme will work perfectly for sportsmen with their body mass lower than 100 kg. Heavier competitors may use an additional portion on non-workout days in the afternoon. The optimal time of use is at least 8 weeks. It is worth combining with beta-alanine for the synergistic effect.